This article is dedicated to the Galindo family and their sacred work. After the failure of the exorcism in the Andes, about which I have written previously, I was invited to visit the shaman, Gumecindo or ‘Gume’, and the rest of his shamanic family, the Galindos, where they live in the rainforest on the banks of a tributary of the Ucayali River, itself a tributary to the great Rio Amazonas, to work intensively with them and the psychotropic plant ayahuasca – known to the indigenous people as Mother Ayahuasca – outside of their normal retreat programme. Being aware of my state of penury, they had offered to do this for free, and the Vietnamese-American doctor I had met in the Andes, on hearing of my plight, even offered to pay for my flight! In the event, I managed to scrape enough money together myself, but in return for the family’s generosity, all I could materially offer was a collection of brightly coloured T-shirts for the children. I travelled from the airport to the jungle town of Iquitos in a three-wheeler ‘mototaxi’ with my bags tied to the back. We set off in a crush of similar vehicles, cars, and trucks, like the start of a Formula One race, with vehicles accelerating and jockeying for position over four lanes of a two-lane highway. After the traffic had finally spaced out, somewhere down the highway we were stopped by a policeman where, waiting in a side road to our left, stood a gigantic juggernaut, pristine in gleaming chrome with lemon-meringue-pie-yellow livery, and its idling engine powerfully drumming – a beacon midst the general disrepair of the surrounding environment. As the policeman waved the truck through, it appeared to launch itself directly at us, causing me to duck my head and throw myself towards the side of the road. As it roared passed in a storm of dust and stones, with its horn blaring, it was closely followed by a black limousine with equally blacked out windows, escorted by a phalanx of police motorcycle outriders with their lights flashing and sirens wailing, careering all over the road. The limousine was followed in turn by two large SUV’s with heavies hanging out from the windows and standing up through the sunshine roofs, accompanied again by more police uneasy riders. As the whole hellish cavalcade passed us, I assumed that it was members of one of the drug cartels, which have been moving into the rainforest of the Amazon in increasing numbers over the last few years, on their way to town, when as we moved off down the road, my driver turned his head to one side, and through stretched vermilion lips, screamed against the receding pandemonium, “El Presidente!” It was an unnerving welcome to the Amazon Basin. As we continued on our journey, I noticed above the road, towers of vultures silently spiralling and casting their wheeling shadows on the tarmac in front of us as we passed a battered Japanese pickup parked at the end of a rough track, with a rough-hewn coffin lying in the back. The whole journey reminded me of a scene from Fear and Loathing in Las Vegas. Only as yet, I had not ingested any mind-altering substances. On my arrival in Iquitos, I met up and had dinner with Roberto, a Colombian who was in charge of organising retreats, and his Irish assistant Tom – two guardian angels who would both accompany me during my stay in the rainforest. After a humid night in my hotel, early the next morning Tom and I travelled to the town of Nauto, where we caught a Rapido – a boat powered by three large outboards with seating for about twenty passengers – to a riverside village, some four hours away, called Jenaro Herrera, where we collected some supplies and I made the obligatory visit to the local police, while waiting for the family’s own boat to pick us up and take us to their home of wooden huts thatched with leaves, on the bank, further upriver. On our journey, we passed the famous pink river dolphins of the Amazon – the boto or in Spanish bufeo – whose presence was announced by their sudden breathy gasps, as they surfaced near to our boat. And above us, now and then, we were accompanied by large iridescent Blue Morpho butterflies, like shards of sky flickering across the river from one bank to the other. That night, after dark, in the ceremony hall or miloka, Gume’s parents, who were both about my own age and maestros themselves, led the ceremony, the form of which I have already described in my earlier piece on my experience in the Andes. Once the ayahuasca began to take hold, the icaros sung by his father, and the rhythmic rustling of his leaf rattle, caused me to immediately become possessed, and the spirit itself seemed to explode in me with a combative rage, roaring and threatening loudly like a character in a Noh play. As the strength of the icaros increased, so did its fury, with my whole body writhing as it expressed the agony being experienced by the spirit, while I wasn’t in any actual physical pain myself. Finally, the spirit began weeping and begging, as it had done the previous year in the Andes, and the icaros were brought to a halt. For now, the spirit seemed subdued, and I found myself in a familiar space of glorious, intricate psychedelic patterns, swirling and ever-changing as though my whole being had become a kaleidoscope. These are usually the prelude to the visions or mariada. Then, within a very short space of time, I saw, as though watching a movie, my whole life pass rapidly before me, as is typically described in the case of drowning or other sudden deaths. As this passed, it was as if my disembodied consciousness had become suspended in a cloudless, incandescently blue sky, and I immediately had the greatest clarity of mind I have ever experienced. I suddenly saw things about my life I had never before understood. One of these, and central to the reason I was in the rainforest, was that my former shamanic teacher in Japan had lied to me about the identity and nature of the spirit that possessed me. Mother Ayahuasca ‘told’ me that my teacher had identified the spirit that possessed me, as an ancient ancestor of mine, in order to distance my possession from an immediate Japanese context, and thereby she imagined, from any responsibility for, or connection with herself, in her anxiety that we might in the future, take legal action against her – something that, in the event, would have been a completely foreign thing for us to do, for whatever reason. My mind continued to be so lucid that I even began to recall badly written passages in previous books and writings which had been published in the past, and began rewriting them in my head! As the strength of the visions was waning, I suddenly heard, somewhere around my head, the high-pitched and pure tweeting of the luminous spheres that I had met in the Andes, and which I described in my earlier essay, but on this occasion without any visual sighting of them. Towards the evening of the second night, I began to feel a strange ambivalence and suddenly no longer wanted to participate in the imminent ceremony. I later wondered if it was the influence on me of the spirit’s own fear of eviction that had created the negativity in me. I reluctantly drank the tea bark at five o’clock, and tried to think of ways of avoiding the ceremony. Having expressed my situation to Tom, he played some Irish music on his mobile phone, which somehow helped begin to dispel some of my anxiety. Slowly, to my amazement and somewhat concern, considering what was about to take place, the miloka began to fill with the wives and children of the different family members, who sat around the walls of the miloka’s large space in a circle. It occurred to me, that this may have been to strengthen the psychic energy in the hall, and also to accustom the children to the kind of event that was about to take place in the form of the exorcism – although it’s possible, of course, that the children were already quite familiar with the nature of exorcism and the ways in which spirits manifest themselves, not forgetting that they had first been in contact with ayahuasca as a foetus in the womb, as the women drink a little for this very purpose, when they are pregnant . Some time in the early hours of the morning, as I lay there and the effects of the ayahuasca had waned, I realised that for some long time, I had been listening to the engine of a boat very slowly moving upriver towards us, and I remembered someone saying at lunchtime, that there was a rumour on the streets of Iquitos that we were going to be raided, but by the police, locals, or other shamans jealous of the Galindos success, wasn’t made clear. At that moment, powerful lights began strafing our huts, while the slow chugging of the engine continued. The lights seemed to search every inch of the huts and the surrounding rainforest for about fifteen minutes before they were extinguished, and the rhythm of the engine changed to a higher pitch, as the boat continued upstream. It was a tense quarter-of-an-hour authoring several dire scenarios! After the sound of the boat’s engine had been consumed by the jungle’s own cacophonous nocturne, I returned to my hut and slept. When I woke, with the sun streaming through the window and the air already heating up, I found I was still carrying my depression of disappointment that once more the spirit seemed to have prevailed over the shamans, and the exorcism had failed. I washed my face and walked along the riverside to where a platform was anchored to the bank, and from which the family washed both themselves and their clothes. Mami was rinsing something in a bowl, and squatting beside her was a beautiful young German woman who had recently arrived after having been wounded in some way with “psychic darts” by a shaman she had become involved with, and who the family were in the process of healing. Fortunately for my phrase-book Spanish, she spoke both excellent English and Spanish. Through her, I told Mami that I thought the exorcism had failed. “No,” Mami replied, “he’s weakened now and on his way. Don’t worry. You have a good body and a good heart.” Later, the German woman told me that Mami had told her that I had been “practicing magic”, which I assumed was the way she saw and understood my previous work with meditation and my shamanic teacher in Japan. However, I was still not convinced, and continued to hold my sense of failure. That afternoon, Gume came to me and said that he felt that I was holding onto the spirit, which I suddenly realised was true – it had been with me for so long I was somehow attached to its presence – and that he was going to give me a special flower bath that he had been preparing all morning. I had to strip naked, and pour the specially prepared water from the bath, with the aid of a scoop, over my entire body, and once I had used up all the water, I was to allow my body to dry naturally, which I did by walking around naked for an hour. In the evening, before the ceremony, a small brazier was prepared, containing a special wood sacred to the indigenous people and called palo santo or ‘holy wood’. Its Latin name is Bursera graveolens, and it’s of the same family as frankincense and myrrh. This was set alight and placed between my feet as I stood in front of the altar or mesa for half an hour or so, steeping in its resinous, perfumed smoke, until I felt like a fragrantly smoked Arbroath smokie! That night, after receiving the ayahuasca, with Gume powerfully leading the singing of icaros, I had many vision, followed by the worst vomiting I can ever remember, while both Gume and Papi worked where I lay, with icaros and the healing smoke. Later, as I lay awake on the mattress, Roberto walked by me and dropped a large sphere of black obsidian beside me – a healing stone of the type once used by the Aztecs. I spent the rest of the night passing the sphere over and around my body, and the realisation came to me that there had been no sight or sound of the spirit that night, in spite of the ayahuasca and the icaros. The next morning after breakfast, Gume had me sit in a chair in front of the mesa while he worked with the smoke and icaros, occasionally spraying my head with Agua de Forida which contained some kind of infusion. He then asked me to lie on the floor while he sucked first from my left temple area three times, expelling something from his mouth on each occasion, and sealed it three times with a cross, as he had done in the Andes, followed by my right temple. He continued to pay particular attention to the whole right side of my head, where many years previously, a Chinese shaman had warned me that I might suffer an aneurism due to my working with spirits without the proper training. During the day, about twelve people from various different countries arrived for the next scheduled retreat. That night was to be my last ceremony, and since I had to return to Iquitos on my own the following morning, and in the course of my journey jump mid-river from the family’s boat and onto the bow of the Rapido, while carrying my rucksack and bag, in order that I would be totally ‘sober’ I declined to drink the ayahuasca that night. Instead, the family asked me to sit with them, between Mami and one of Gume’s brothers. Since the miloka is in total darkness after the ceremony, I listened as the ayahuasca took hold of the new retreatants – the vomiting, gagging and moaning that I was familiar with myself. Two or three hours after things had become quiet I went to lie down on a mattress by the wooden wall of the miloka and with my head up against a large plastic tub. I had been lying for a while when I became aware of an agitated scratching sound, and switching on my half-covered head-torch, the only light allowed, I searched three or four times for its source, but could see nothing and assumed it was a creature on the wooden walkway outside. The next morning I discovered it was a cayman they had caught and placed in the bin that I had leant my head against. I had been slightly concerned about my return trip upriver and back into Iquitos with my poor Spanish, but all turned out well, as so often in situations which give rise to a certain unnecessary anxiety. Before arriving in Peru, I had been suffering pains and stiffness in my knees, which were also frequently becoming swollen, and had been diagnosed by doctors, with arthritis. In fact, the night of my arrival in Lima I had suffered pain in my hotel bed, and worried about my trip. On meeting the Galindo family, I explained to them about my knee condition, and they told me not to worry because they would add some plants to the general ayahuasca brew that would “take the cold out of joints”. It has been over a year now since I returned from the rainforest, and there has been no evidence of the spirit, in spite of returning to the activities which invoked it in the past, like chanting, meditation, or listening to recordings of icaros. Likewise, there has been no hint of the arthritis in my knees, and I walk happily in the hills of the island I live on, once more. 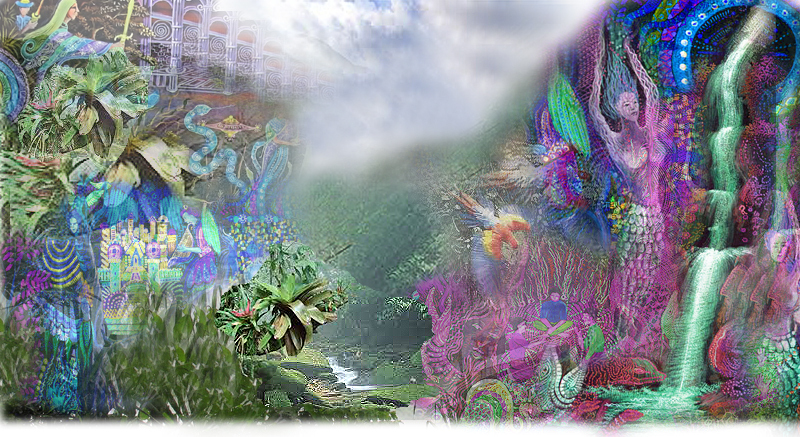 This entry was posted on 7 May, 2015 in homepage and tagged Amazon, Ayahuasca, Claire Palmer, Galindo Family, Malcolm Ritchie, psychedelic drugs, South America. Bookmark the permalink. I am curious about which center you went to!